An 83rd minute winning goal from Alex Fletcher not only wrapped up a first win in Phase Two, but also a comeback win after the hosts were 1-2 down. The five goal thriller had everything from Newtown being 1-0 up, to 1-2 down to winning the match 3-2. 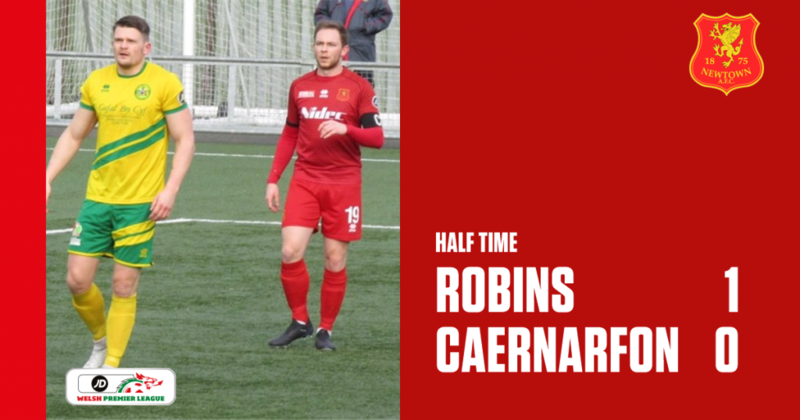 Goals from captain Craig Williams, Porya Ahmadi and Fletcher helped the Robins climb over the Canaries to fourth position in the Welsh Premier League table. Barry Town, who are third in the table, drew at The New Saints on Saturday which now means Newtown have reduced the gap to nine points. Newtown manager Chris Hughes made a couple of changes to the starting line-up that lost at The New Saints the week before. 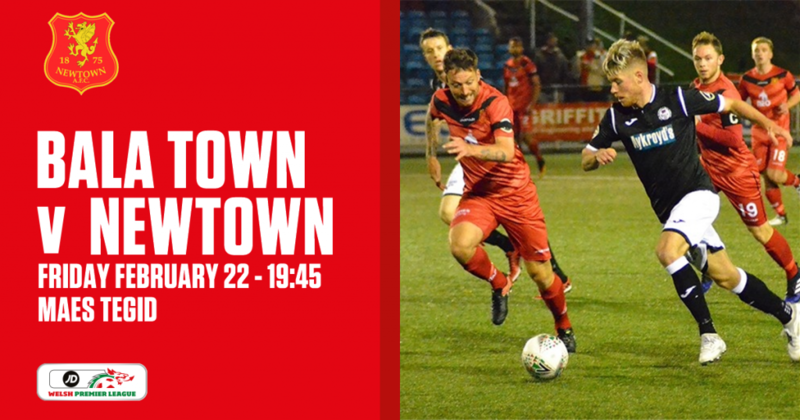 Both George Hughes and Neil Mitchell began the match from the bench to make way for Sam Phillips and Luke Boundford while Jack Perry remained in goal as Dave Jones is still recovering from the concussion against Connah’s Quay Nomads. 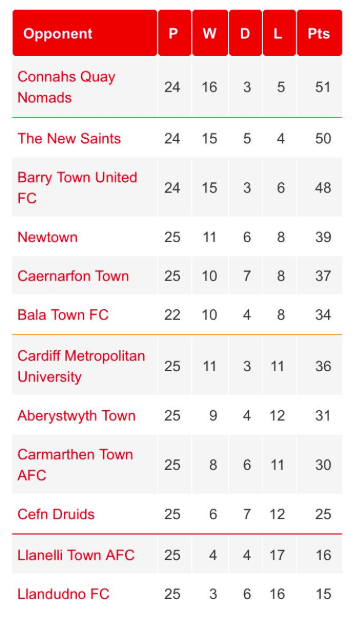 Ahead of kick-off, the Welsh Premier League table would hint that the match would be a close one as Newtown were just a point behind the Canaries at the start of the day. 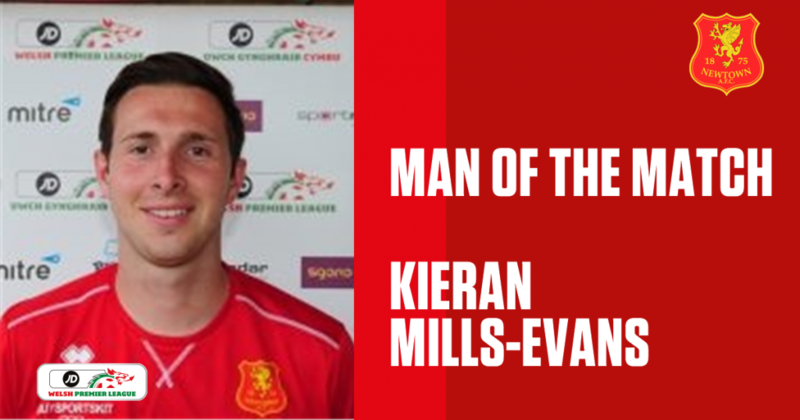 The first eight minutes saw the hosts have the first go up front as a terrific forward ball from Craig Williams found Porya Ahmadi outside the box but failed to lob the ball over the Caernarfon goalkeeper. Six minutes later and there was a scary moment for Newtown when Perry dropped the crossed ball on the goal line but luckily the loose ball was cleared away. When the match reached the 20th minute mark, the encounter between both sides was displaying an end to end clash. A pass from Ahmadi to Boundford opened up an opportunity for the striker to score but instead rolled his shot just a little wide past the post. 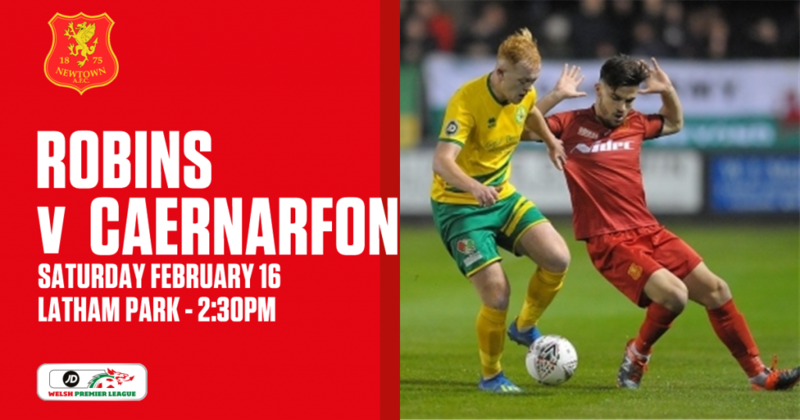 Ahmadi was in action just three minutes later by picking up a forward ball from Craig Williams in Caernarfon’s box, but Ahmadi was beaten in the run for the loose ball from Canaries’ goalkeeper Nick Bould. Before the half hour mark, there was a double chance created for Newtown. The first one being a splendid run into the box from Sam Phillips moments before his shot was blocked by the keeper and Nick Rushton heading the ball a whisker over the bar. The handful of chances were paid off on the 32nd minute when Williams took the corner, it curled and then found the back of the net with no touches before crossing the goal line. A terrific goal from the skipper – even if it wasn’t meant. It wouldn’t be long until the visitors would try and respond to the scoreline as Caernarfon’s Darren Thomas got himself one on one with Perry but thankfully the 21 year old saved the shot with his knees. Four minutes before the interval, Caernarfon looked hungrier when a splendid ball from Bradley was on display that was collected by Jamie Breese but his shot driving past the far post. There were no substitutions made from either side during the half time break but it didn’t matter for Caernarfon as it would only take six minutes into the 2nd half for them to find the equaliser. It was a dispossessed moment for Phillips giving the ball away just outside the Newtown penalty area, Bradley intercepted and went on to get the task done. The match started to go the other way for the reds and then the unthinkable happened when Caernarfon turned the scoreline around. Breese produced the cross for Thomas to convert the ball home at the near post. If the scoreline was to remain, Newtown would concede a third consecutive defeat in the league. The attitude and spirit was high with Newtown for the remainder of the match as a quick headed equaliser from Ahmadi made it 2-2, just 60 seconds after they were 1-2 down. When the match clock reached the 83rd minute, Newtown were back on top thanks to Alex Fletcher by finishing off Rushton’s low pass across the box. The comeback was complete and Newtown have still only conceded one defeat at Latham Park in the current league campaign. It's Alex Fletcher who scores the goal after placing the ball perfectly low into the bottom corner of the net! From 1-0 up, to 1-2 down – the Robins come out on top after a classic clash with the Canaries. Newtown AFC: 13. Jack Perry (GK); 19. T. Craig Williams (C), 3. Callum Roberts, 26. Sam Barnes, 5. Kieran Mills-Evans, 6. Jay Denny, 17. Sam Phillips (18. George Hughes 69′), 23. Alex Fletcher, 8. Nick Rushton, 9. Luke Boundford (11. Joe Kenton 69′), 32. Porya Ahmadi (10. Steve Leslie 81′). Substitutes: 11. Joe Kenton, 18. George Hughes, 7. Neil Mitchell, 10. Steve Leslie, 25. Will Evans, 21. Dave Rose (GK). 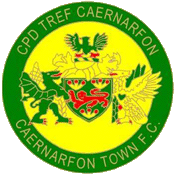 Caernarfon Town: 22. Nick Bould (GK); 3. Nathan Craig (C), 5. Gareth Edwards, 6. Rhys Roberts, 7. Gareth Evans, 8. Jamie Crowther (11. Danny Brookwell 90′), 9. Jamie Breese (20. Cai Jones 80′), 10. Darren Thomas, 17. Ryan Williams, 19. Sion Bradley, 25. Leo Smith. Substitutes: 1. Alex Ramsey (GK); 11. Danny Brookwell, 16. Kevin Roberts, 18. Dion Owen, 20. Cai Jones.